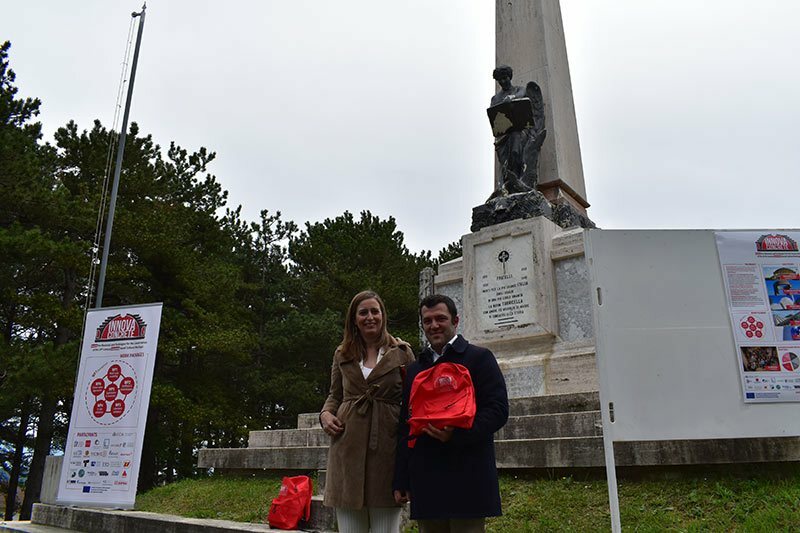 On the 14th and 15th of May 2018, the sampling of the War Memorials selected as case studies in Torricella Peligna (Abruzzo, Italy) was conducted by the MiBACT and CNR teams. Representative concrete samples have been taken from the two monuments, the Angel and the Tower, that were chosen for their symbolic and social values and also for their different construction period and structural elements. During the sampling activities, a visit was organized in Torricella Peligna with the participation of the Project Coordinator Maria J. Mosquera, the Mayor Carmine Ficca, the CNR researcher Gabriella Di Carlo and the MiBACT restorer Maria Isabella Pierigè. The sampling activities were carried out by the MiBACT team, that is responsible for the monument, in collaboration with the CNR team (ISMN, ISTEC and ICVBC), that have scientific competencies for the monument characterization. The ICVBC Mobile, led by Piero Tiano, collaborated with the sampling activities performing evaluations directly on site. At the Tower, which is a quadrangular structure with a truncated pyramid entirely in cement, the concrete samples were taken both from the external and internal surface at different levels by considering the conservation state and representative areas for the in situ validation of the InnovaConcrete materials and technologies. At the Angel, a winged concrete sculpture, some representative samples were taken from different areas by taking into account the degradation processes and the concrete properties. The two War Memorial monuments have different characteristics and conservation problems. In particular, the Tower is structurally more similar to a building and the Angel to an all-round statue. Moreover, their location also contributed to different conservation problems, providing excellent examples of case studies for the InnovaConcrete project.